The 'Wild Flowers' series gathers together a pretty selection of finely detailed floral motifs to produce a varied set of items which is great for the ‘mix n match’ approach to selecting and wearing jewellery. The many floral motifs available allow you to select individual items thus creating a very individual look of your own. Bohm have used enamels, sparkly Swarovski crystal elements, faceted glass and crystal beads to decorate this feminine series. In burnished patina finish metals available in either silver with blues and purples or gold with bright shades of crimson and green. The Bohm Wild Flower crystal cabochon necklace. These motifs are attached to a flat woven fluid chain that sits on the neckline perfectly. Burnished finish. The various motifs measure from 9mm up to 2.5cm/25mm. Adjustable length 40cm/16 inches to 48 cm/19 inches. The Bohm Wild Flower linear pendant necklace. A linear vertical arrangement of crystal cabochons and flowers. Burnished finish. The various motifs measure from 9mm up to 2cm/20mm. The pendant is 7cm/70mm in length. Adjustable length 40cm/16 inches to 48 cm/19 inches. The Bohm Wild Flower long length locket pendant necklace. Filigree disc locket. Burnished finish. 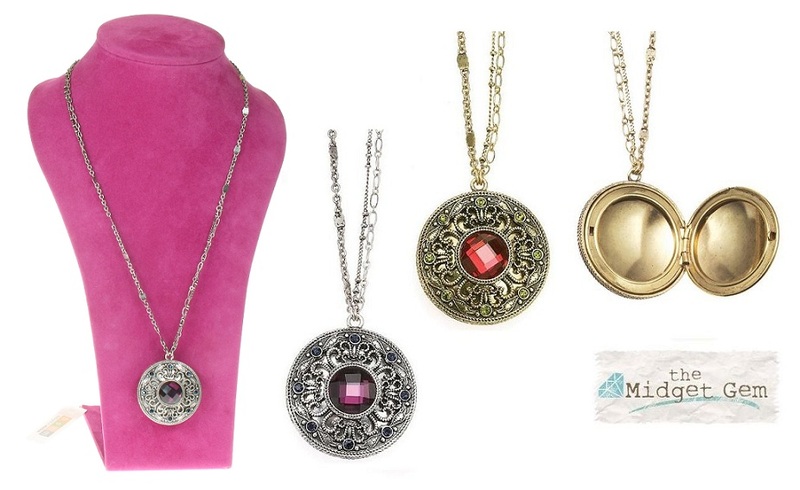 The locket measures 4cm/1.5 inches in diameter. Adjustable length 81.5cm/32 inches to 89 cm/35 inches (clasp with extension chain). The Bohm Wild Flower crystal cabochon bracelet. The motifs are attached to a fluid 'flat' woven chain that sits on the wrist perfectly. Burnished finish. Motifs measure from 9mm up to 2.5cm/1 inch. Adjustable length 19cm/7.5 inches to 23cm/9 inches. The Bohm Wild Flower filigree flower ring. Swarovski crystal centre. Burnished finish. Flower measures 2.5cm/25mm. Adjustable ring size. The Bohm Wild Flower bead flower earrings. Faceted crystal beads and Swarovski. Burnished precious metal plates. The flowers measure 1.3cm/13mm. Total length 2.5cm/25mm in length. French clip fastener for pierced ears.